Necromancers are wielders of unearthly powers, often controlling the energies of death to raise the dead and force them to serve and do their bidding. And in this Necromancers Armor, you will look just like one of these fearsome and dangerous warriors. This armor is nothing if not impressive and eerie, possessing black coloration and detailing that makes it perfect for those who align themselves with the dead. The armor is truly more of a harness, possessing almost full torso coverage in both the front and back, utilizing various levels of layered leather plates that not only add protection to the armor, but also enhance its overall look. All of leather layers and plating have been riveted in place, which ensures that the armor is durable and adds a touch of gleaming silver to the darkened appearance. The Necromancers Armor is not just a cuirass and backplate, though, as it also includes a set of matching pauldrons and a wickedly impressive belt. 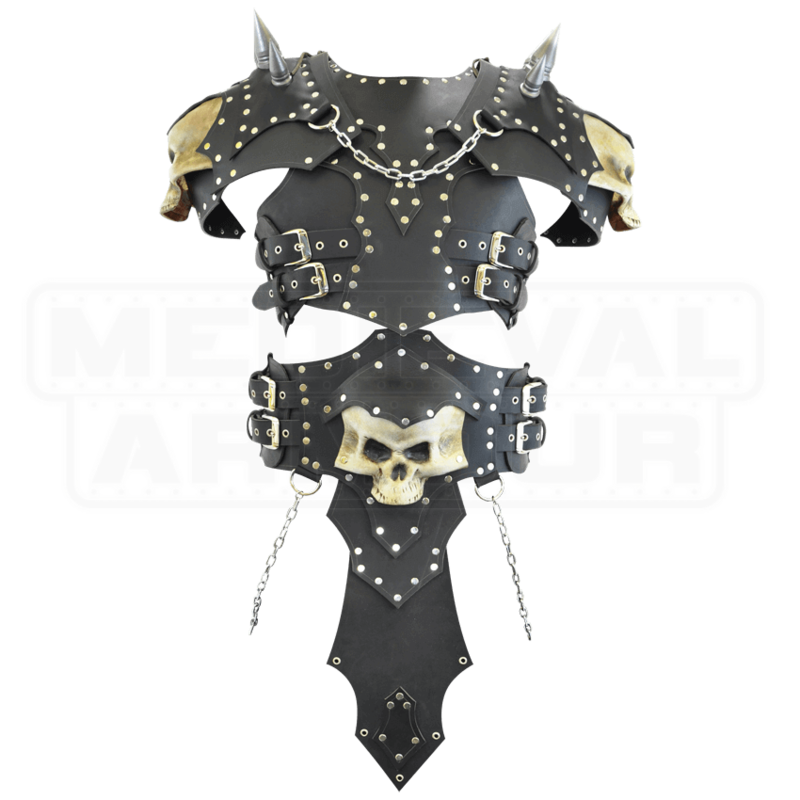 Each pauldron ties to the leather breastplate and features similar construction of black leather and silver rivets, while possessing several spikes along the shoulder, as well as a wicked skull decoration on the shoulders side, giving this armor a true deathly look. D-rings on the shoulders also allow for two chains to be draped between the pauldrons, keeping them linked and together. The belt completes the armor, possessing similar construction to the armor and the pauldrons. It also features a decorative skull plate on the front, as well as a hanging central tasset for both protection and decoration. Leather straps and buckles on the sides give the belt a measure of adjustment and decoration, while the hanging chains drape on the sides and cross over in the back to add a bit more decoration into the armors appearance. The armor comes in one color, to better suite its deathly and dark look and feel. Each size is worn using the breastplates buckles and straps, which give each size a measure of adjustability. With that in mind, make sure you order your armor as close to your natural size as possible and then adjust it to fit and comfort. 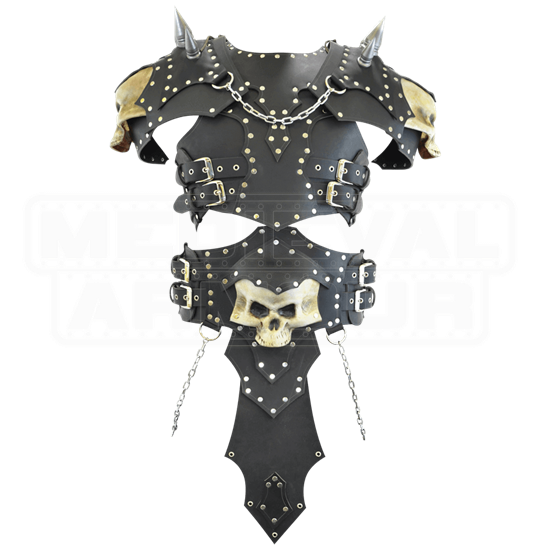 This armor is adorned with decorative spikes, which are crafted from high quality foam, similar to foam found in LARP weapons, rendering the spikes realistic to look at but safe to touch. Some say that you have no reason to fear death, but sometimes, they are wrong, especially when you find yourself facing a warrior or a barbarian garbed in this Necromancers Armor.